This is a take on a something I saw in a magazine article. 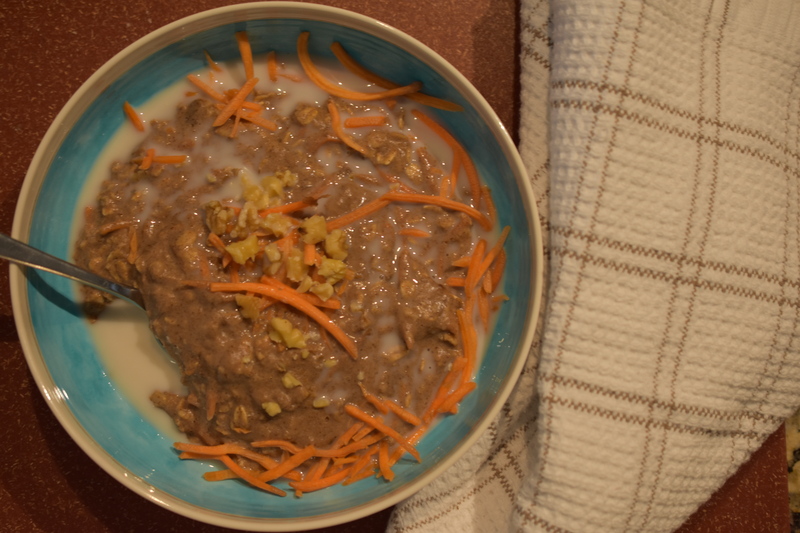 The article had this in an overnight oats version, but I wanted oatmeal for breakfast so I made some changes that resemble some of the ingredients I usually put in my carrot cakes. Besides, there is nothing like combining vegetables, dessert and breakfast all in one dish. You really cannot go wrong with this healthful and filling breakfast to start your day off full of energy to tackle whatever comes your way. This is a hearty recipe for one, yet, if you do not want such a large portion you could divide up for a future breakfast for another time. In a medium saucepan combine all ingredients, except those for garnish. Cook over medium heat until oats start to bubble. Stir frequently. Spoon into bowl and garnish with carrots, walnuts and a splash of milk. Thank you. It reminded me of carrot cake. These are some of my favorite spices to use, especially in oats or baking.